An outstanding apartment in a fabulous location (just off the Zattere) and justifiably one of our TOP properties, lightly renovated and updated in 2016 and with great views over the ‘Rio De San Sebastiano’ canal - a riot of Venetian colour and character in the Dorsoduro district. Ca’ San Sebastiano’s position near the vaporetto stop of ‘San Basilio’ (with no bridges to cross in between!) allows for easy and hassle-free sightseeing while its closeness to the ‘Stazione Marittima’ makes it a perfect choice for a memorable stay in a truly authentic area of Venice if arriving or departing this port by cruise ship. 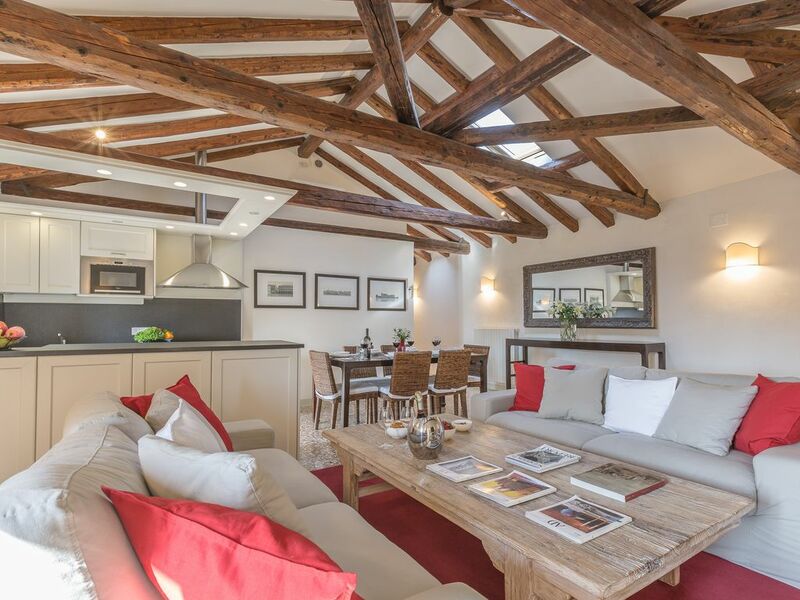 Successfully marrying the old and characterful with the lastest design concepts, Ca’ San Sebastiano’s spacious and beautifully decorated main living area features high ceilings, exposed beams, canal views, air-conditioning and internet connection. It comprises a sitting and dining area with plenty of comfortable seating plus a modern and well-equipped kitchen with cool terrazzo flooring, unusual polished plaster finishes and matt granite work surfaces all contributing to its smart and highly contemporary appeal. This property is quite spacious and was perfect for two couples. The area was very quiet at night which was great for sleeping. I cannot say enough great things about Views on Venice. They organized our water taxi pick-up from the train station, our boat tour with Marco and our van to the airport. Special thanks to Marta at VoV for making everything so easy. The apartment is immaculate and very comfortable. It is air conditioned, which was a blessing during our stay when the weather was so hot in Venice! It's position close to the San Basilio vaporetto is perfect : quiet but easy to access everything in Venise. We would strongly recommend this apartment to anyone coming to. Isi the this beautiful city! It's rare to find apartments where the reality is as good as or better than the pictures and description on a website but that is what this apartment is. Very comfortable, clean and plenty of space. Heating for slightly chilly mornings worked perfectly and it has air conditioning for the summer. All toiletries supplied and a seemingly endless supply of towels. Kitchen as well equipped as one could wish for although it was little used as there are so many excellent restaurants within minutes of walking. The location is in a quiet area but with usual neighbourhood noises supplemented by the sounds of boats passing on the canal directly outside none of which were disturbing. The only reason for 4 stars instead of 5 is that this is a 4 bed apartment not 5 as claimed, the sofa cushions were fine for one of our children but I doubt if an adult would get a comfortable nights sleep. We thought the apartment was great. It is located away from the the San Marco area which I think would be too crowded and too loud. This location was easy to get to with a Water Taxi within 2mins and lots of local places to eat nearby. The apartment was clean and cozy for our family of four(4), and matched the description from the website. The management company was great to work with and easy to contact when we had questions before our arrival....very professional. We enjoyed the apartment the whole time and would highly recommend this property to friends and family! The apartment exceeded our expectations. It was spacious, light, well equipped and comfortable. Great location on a canal and close to sights and restaurants, yet far enough from the crowded tourist attractions to make it quiet and relaxing. Boat docks where one block away for easy access to the Grand Canal, but we walked everywhere. Daniel and Christina were most helpful and answered all of our questions. We highly recommend this apartment and would stay there again. Thanks so much for your fabulous review, we’re delighted you liked our Ca’ San Sebastiano apartment and our dedicated customer service! With all the best wishes from us all at the office and hope to see you again soon! The apartment was exactly what was in the description. Great location, clean and well maintained. We loved the restaurants, shops and 1 block away supermarket. My only complaint was the washing machine. I wasn´t able to use it and there was no dryer or any way to hang wet clothes. Thank you so much for staying with us and for writing in, I’m delighted you liked Ca’ San Sebastiano and its location. Please accept my sincere apologies for the washing machine issue (it has been solved now but we have a 24/7 number where we can be reached any time for assistance and you should have used with no hesitation as our staff is always happy to assist our guests). Hoping we have the pleasure of seeing you in Venice again soon. The apartment is located in the Dorsoduro area, very close to the San Sebastiano Church. This Sestriere is one of the most beautiful areas where you can find the Accademia, the Guggenheim Museum, the beautiful Zattere with the spectacular views on the Island of Giudecca, the Carmini Church and so much more.